There is nothing more tempting than the big-eyed face of a puppy. Seeing one through a pet shop window must be the human equivalent of kryptonite because all it takes is one shot of their tiny paw pads pressed against the glass to make our knees go out. But what if we told you that life for these perfect little puppies wasn’t always so cute and that by purchasing one of those irresistible little ones, you would be condemning hundreds of other dogs to a life of abuse and suffering. Well, tragically, thanks to the puppy mill industry, this is exactly what happens. 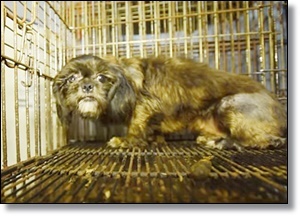 Puppy mills are large-scale dog breeding facilities where puppies are churned out like a machine. In the video below, you can see the horrific reality of what a puppy mill looks like. Breeding dogs never get to leave the mill but spend their entire lives in tiny wire cages, deprived of basic medical care, food, and water. Many dogs are covered with their own filth and suffer from severe dental and other medical issues. These pups know nothing but exploitation and abuse at the hands of humans and have to endure the pain of giving birth and having their puppies taken away far too soon. The most disheartening part of this industry is the fact that the sale of those puppies only enables mills to continue breeding and abusing their parents. With millions of healthy dogs waiting to be adopted in U.S. shelters, the idea that there is an entire industry dedicated to mass-breeding new puppies is not only disgusting but downright irresponsible. The good news in all of this is that there are many organizations working to rescue dogs from mills and raise awareness for the plight of these animals. Here we see the Humane Society of the United States save over 140 dogs from a terrible mill in North Carolina. Don’t support the puppy mill industry, always adopt and don’t shop! Share this video and encourage others to learn the truth behind the puppies in the window.